Welcome to a prestigious, luxurious estate in the new nationally-acclaimed Hidden Canyon. 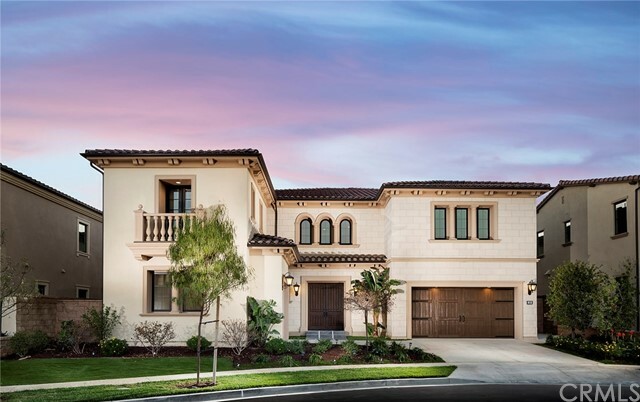 This magnificent �Marbella� collection Santa Monica Residence �Italianate� is brand new and sits atop Hidden Canyon on an expansive premium 8,824sf lot with one of the best panoramic views in all of Irvine! The 24/7 guard gated community is nestled on a private cul-de-sac surrounded by the rolling hills and open spaces of the Laguna Coast Wilderness Park. A dramatic entry presents double winding staircases, high ceilings and an open floor plan with designer paint, granite countertops and cabinets throughout the home. Highly upgraded dual sets of pocket sliding doors lead to a covered outdoor living area perfect for al fresco dining year round. The gourmet kitchen hosts over-sized double Granite islands, counter seating and the finest of luxury-branded stainless steel appliances. There are 5 bedrooms, 5.5 baths, an upstairs bonus room and a 3-car garage. A convenient downstairs bedroom includes a full bath. The stunning master suite feels like a resort with a retreat area and upgraded extended deck. The spa like master bath has a massive glass walk-in shower, separate tub and immense walk-in closet. Amenities include a luxury clubhouse, large pool, furnished cabanas with large screen TVs, a local park, tot lot and hiking trails. Live in the award-winning University High School district close to the Irvine Spectrum, John Wayne Airport, Laguna Beach, Newport Beach, I-405, I-5,I-133.